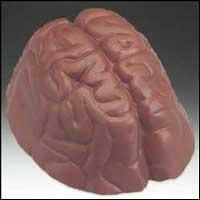 Bite into our solid milk chocolate, anatomically correct human brain. Made from premium chocolate, they make the ultimate gift for doctors, anatomy students or your sweetheart. Each brain is cello wrapped. Our brain comes in a gift box with fancy crinkle paper and we will even do a gift card of 25 words or less. Contact us for special pricing for bulk orders.